Naghmeh Sohrabi (NS): I was taken aback by a scene in your book when the Palestinian philosopher Hisham Sharabi during his graduate studies in the University of Chicago writes a research paper for Jean Wahl on Abd al-Rahman Badawi’s book on existentialism. Wahl’s response to Sharabi’s paper and the translations of Badawi included in it was to say this is ordinary, derivative of Heidegger, and that “there is nothing new in them.” I was taken aback because for those of us working on topics such as existentialism or revolution from a non-Western place, one of the major obstacles we deal with is the anxiety and the reality of being consigned in our fields to a “derivative” space, wherein our knowledge production is categorized as the manifestation of these grand universal ideas in specific geographies. Your story reflects this for Sharabi and his generation. Is this something you were also thinking about in writing this book? Yoav Di-Capua (YD): The so-called question of derivative thought and action in the history of the Middle East is a chronic one as it keeps returning again and again regardless of sincere efforts to address it. Just think of Ernest Renan’s Averroes et l’averroïsme (1866) a text that attacks the Arab capacity for critical reasoning and prepares the ground for the idea that all Arab thought is derivative. I first encountered the lingering power of this argument as an undergraduate student. Growing up, I had heard so much about Egypt’s Gamal Abd al-Nasser that one of the first things I did as an undergraduate student was to enroll in a seminar about the 1952 revolution in Egypt. I knew that millions of Arabs had been mobilized as a result of 1952 and that they saw the revolution as a form of post-colonial redemption. It was clear that an entire generation was totally psyched about Nasserism and I wanted to understand how and why this was the case. Much to my surprise, the point of that semester was not the Arab experience of their revolution but finding out if Egypt’s revolution was a “real revolution” or something else and, if so, what kind of something else. We read a lot about “soft, semi-soft” and “hard” revolutions and I remember thinking to myself, is this a history class or a workshop on how to find out if your French cheese is ripe and ready to eat? It made no sense at all. Why spend an entire semester subconsciously measuring Egypt’s revolution against the mother of all revolutions, that of the French? We never considered an alternative framework. We never heard of Haiti. Some ascribe this cognitive distortion to the problem of Orientalism and prescribe the theoretical proposition of provincializing Europe and engendering new epistemologies. Global intellectual history is certainly one kind of response to it. But whatever the theoretical remedy, the question of fidelity to (European) origins tends to persist and, for obvious reasons, it is also relevant to a book about Arab existentialism. So, was Arab existentialism derivative as Jean Wahl dismissively exclaimed? My answer: it’s the wrong question. The more pressing concern revolves around the need to clarify the Arab human condition and, with this in mind, to find out what were the tasks of Arab existentialism. After all, we are talking about the largest and most sustained existentialist scene outside of Europe. What did Arabs find in existentialism? What did they seek to remedy and in which ways? Given the cultural hegemony of Arab existentialism during the era of Decolonization we should try to understand in which ways it sought to further and deepen this process. I argue in my book that if we follow this path we will discover completely new experiences, as well as human and intellectual connections that were hitherto invisible. The Arab rapport with Sartre and the hope of global emancipation is an example of such a lost connection. This, in my mind, is what we gain by taking local experiences on their own terms. For all his genius, Wahl, I am afraid, got it wrong. NS: Throughout the 2017-18 Sawyer Seminar on Contextualizing Twentieth Century Revolutions in the Middle East, Latin America, and the Caribbean, our seminar kept mulling over questions of tragedy in revolutions, the distinctions between failure and defeat, and the pervasiveness of post-revolutionary disappointment. Is your book also engaging with these issues, particularly in its reframing of the defeat of the Six Day War in 1967 to avoid the more common reading of it as the cultural failure of an entire generation? YD: The topic of cultural defeats and what sets them apart from mere disappointments and setbacks is a fascinating one. In the context of the 2011 Arab revolutions and their defeat or metamorphosis into civil wars, it is also a very relevant topic. Arab intellectuals are no strangers to talk about revolutions, counter-revolutions, and cultural defeats. In fact, they have been talking of defeat (hazima) since the 1948 war with Israel and, more intensely, since the 1967 war; a war that is normally regarded as a watershed moment that constitutes such cultural defeat. But a defeat of what exactly? What does it mean to say that a certain culture was defeated or that the cause of defeat is culture itself? There are some very serious assumptions behind such claims. When I started researching the book, I did not identify Arab existentialism as its subject matter. That is, I did not set out to write this book. Instead, I was interested in identifying the subject of defeat in the 1967 war, the assumed cultural properties that have been defeated and were responsible for the debacle. In order to do this, I extensively read the books and magazines of the preceding two-decades where I discovered the tradition of Arab existentialism. It became clear to me that while existentialism was by no means the most important thing that happened during this era, it was involved in all the key processes pertaining to decolonization. Indeed, existentialism was involved in the project to forge an authentic philosophy of liberation and in the efforts to decolonize the self and invent the so-called “new Arab man.” It assisted in purging the old intellectual generation, and hand the cultural sphere to young people. Young theoreticians of revolution mined existentialism for its ability to clarify the ontological aspects of Arab existence, and others used it in order to connect the Arab world to the politics of the Global South and the fight for universal emancipation. Thus, given its ubiquity, the versatility and modularity of this tradition is a very good platform for understanding the process of Arab decolonization and the cultural dynamics on the eve of the war. It can tell us, so I thought, what the subject of defeat was in 1967. Cultural defeats in this context are associated with collective trauma and hence, in due time, give birth to extensive and sometimes radical and very violent counter-cultures. While defeat might be collective, it is nonetheless internalized and registered in the constitution of the self as well. As such, it leaves a strong emotional and psychic mark that keeps the defeat “alive” long after the triggering event is over. Yet, though defeat saturates and permeates culture, responses to it vary considerably. Indeed, several historical examples come to mind. In the aftermath of the American Civil War, for instance, the South framed its defeat as a type of moral victory and established the so-called “cult of the lost cause.” In Germany, the Weimar Republic functioned as a kind of trench in which the lost battle of WWI continued daily as polarized ideological groups failed to establish a consensual “founding myth.” Dug in their ideological tranches, they thought of their political stakes in violent existential terms. The French responded to the 1870 defeat by falling back on their revolutionary past, and established a republic in line with the scripts of 1789, 1792, 1830 and 1848. Resorting to a revolutionary past in which the sovereign people take control summoned a triumphal legacy that assisted in “erasing” defeat. Later, after WWII, France invented the myth of collective resistance, which erased the experience of Vichy and the history of French anti-Semitism and auto-Fascism. Known as the Vichy Syndrome, only in the last two decades has it begun to come to terms with the actual legacy of Vichy. One can add to the list the post WWII Japanese counter-culture of pacifism and the Chinese Cultural Revolution of the 1960s as vast responses to the realities of WWII and, in the Chinese case, to its experience of Western imperialism. A similar reading can be applied to the history of Islamic fundamentalism and the way in which, by offering spiritual and moral revival through a metaphysical plight to an imagined unadulterated past, it responds to the collapse of revolutionary Nasserism and its utopian promise. Thus, cultural defeats give birth to extensive counter-projects and/or collective dispositions that tend to either turn the clock back on the defeat, erase its memory, externalize the blame for it by adopting a scapegoating strategy, and so on. In contrast, cultural disappointments and even dysphorias don’t call for such holistic reshuffling, and are quite free of traumatic symptoms such as mass dissociation. NS: The “age of revolutions” in the global south in the second half of the twentieth century seems to occupy the same space as decolonization. As a result, there’s a lot of historiographic slippage between revolution and decolonization. Yet there’s something distinctly different between revolutions and decolonization such that the project of articulating an age of revolutions within the geography of decolonization entails more than merely calling decolonization “revolution” and vice versa. How do you see the relationship between the two? YD: This question is perhaps more relevant to my next book than to the current one. However, for me, the relationship between “revolution” and “decolonization” is a straightforward one in that the former is a response to the latter. That is, revolution is a response to the immense effort to decolonize self and society and engender an ontological shift away from cultural and mental structures, and assumptions of colonial modernity. To understand this connection we need to be mindful of the fact that these revolutions are directed internally as a purifying and a regenerative force. At least in the Arab world, they are being theorized slowly during the colonial era and well before anybody thought or wrote about Third-Worldism and the alliance of the Global South. These embryonic revolutionary theories dealt with key ontological categories such as sovereignty, authenticity, re-birth, and sacrifice. Before anybody thought of capturing political power, revolutionary theory created a conceptual web that was destined to sacralize politics and frame decolonization in terms of salvation. It was built from below, slowly, and sometimes unintentionally. Over the years some of these early writings have been dismissed as mystical, emotional and far-fetched. But regardless, they formed the basis for an entire revolutionary culture that would inhabit the void that was left over by the politics of colonial modernity. Put differently, I believe that Third-World liberation differed from all other forms of liberation and should be theorized from below as a movement that becomes intelligible only if we are willing to consider it through the lens of political theology. In this way, in my next book, I am interested in the political formation of sacredness something that is shared by all efforts to decolonize regardless of their alleged secularism or religiosity,” Leftism,” or “Nationalism.” I would like to argue that all emancipatory promises flirted with messianic eschatology thus introducing their followers to the possibility of redemption. Some may argue that all utopias end in a sense of dystopia and hence there is not much to consider here. I disagree. I think that the Iranian and the Arab revolutionary projects bear a cultural specificity that is important to articulate. Naghmeh Sohrabi is the Charles Goodman Professor of Middle East History and the Associate Director for Research at the Crown Center for Middle East Studies at Brandeis University. She is currently writing a book on the Iranian Revolution tentatively titled Experiencing Revolution: Iran 1979. Yoav Di-Capua is an Associate Professor of History at the University of Texas at Austin, where he teaches modern Arab intellectual history. He is the author of Gatekeepers of the Arab Past: Historians and History Writing in Twentieth-Century Egypt (University of California Press, 2009). 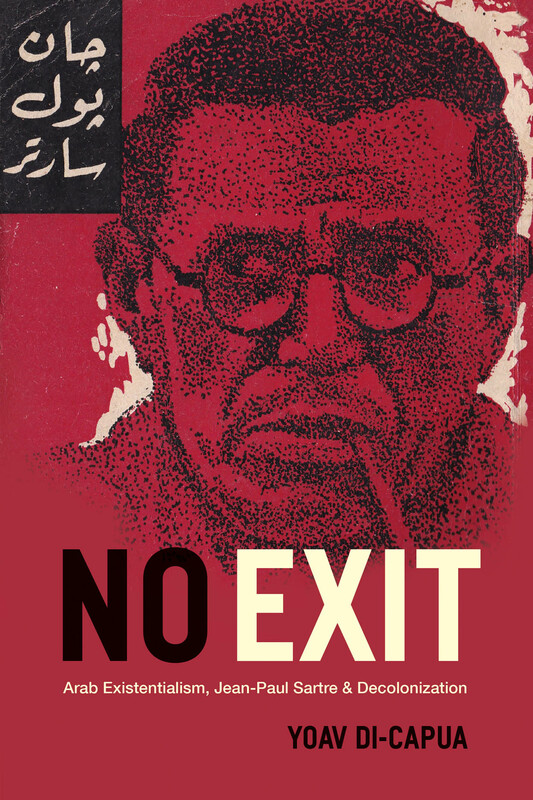 His new book, No Exit: Arab Existentialism, Jean Paul Sartre and Decolonization, was published by the University Press of Chicago. His work is supported by the Alexander von Humboldt Foundation in Germany and the Forum Transregionale Studienresearch in Berlin. He is currently at work on a new book tentatively entitled Sacred Liberation: Decolonization in The Middle East and Beyond.